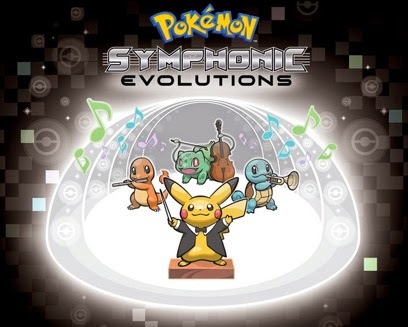 The Pokémon Company International and Princeton Entertainment have announced that the official Pokémon live orchestral concert series, Pokémon: Symphonic Evolutions, will premiere at the famed Warner Theater in Washington, DC on Friday, August 15, 2014. The 2014 Pokémon World Championships will also be held in the nation’s capital that weekend, August 16–17, at the Walter E. Washington Convention Center. The premiere performance in Washington, DC will be followed by a performance at Philadelphia's Mann Center for the Performing Arts on Friday, September 19th. More dates, locations, and ticket information for the concert series will be announced soon and further details, including how to purchase tickets now to the Washington, DC and Philadelphia performances, can be found at PokemonSymphony.com. Pokémon: Symphonic Evolutions will take audiences of all ages on a powerful musical retrospective through the popular video game franchise’s most memorable melodies. This exciting new concert tour reunites key creative producers from the critically acclaimed The Legend of Zelda™: Symphony of the Goddesses concert tour.